Eriskay, an island off the coast of Scotland, is the inspiration for this stunning semi engagement ring with its 18k rose gold band and white gold leaves accented with approximately .07cttw comprised of (16) .004ct rounds. A cubic zirconia center is included. 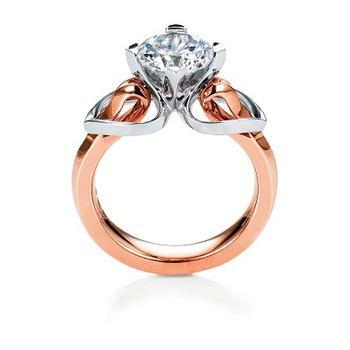 Trademark of the Eriskay ring is its heart shaped shoulders and swan neck shank with pave on top.